I have a boxer and put a lot of effort in making sure she became well educated. It is not so difficult as you might think so if you are interested just relax cause you can get there! First of all it is important to know the breed characteristics. Boxers are medium size playful dogs, very loving and full of tenderness to all members of the family, specially kids. The mainly concern with boxers is that sometimes they can be dominant to other dogs, specially those of the same gender, but that is easily avoid by just socialize them in dog parks and home. I think the sooner the dog education takes place, better and faster are the results. Besides, boxers are sometimes used as police dogs (specially in Europe) so for sure they are smart and capable enough for you to teach them easily. five minutes you need to show your boxer that is not time to play so be serious because then they will understand is work time. How to teach boxers to urinate and poop where we want? Well when my puppy boxer arrived home she was as cute as clumsy and quickly everybody felt in love with her. The only problem was she was not taught and so she pooped everywhere. Since she was just a puppy I just needed about 2 weeks to insure it will never happen again. How? Well I knew that she had a small bladder cause she was a puppy so every time I feed her I quickly put her in the garden to make shore she did her business there. Also I stayed with her so when she did it I congratulated her by using an approval voice and of course cuddle her (it is usually fast, 30 minutes tops). On the other hand, whenever she urinated inside doors I told her she was doing something wrong by using a displeasure voice and then carry her to the garden, the place where she must do it. Basically I think you just need to control the food time so you can take your boxer outside after that. And if you can make some more walks in the mean time, even better! if you hit they probably will not correct their behavior. To add, it can create other issues like poop eating… not so good, right? How to teach boxers to sit? This is really easy. You chose a voice command (I used the word sit), a body command (I pointed my finger to the ground) and a reward (I used dog biscuits). Then you use the voice and body command to tell them what to do and the reward when the response is correct. In my opinion you can also say nice things (good boy alike) when you give the reward to make them understand they are pleasing the owners by the voice tone. I also think that in the beginning we can help a litle more by siting them. For me showing what we want them to do and of course giving the reward is a big step to make them compelled to repeat. After they understand and with a few repetitions, they will never forget! How to teach boxers to lay down? then followed the training, it worked very well! How to teach your boxer to behave on eating time? start doing this as an grown up dog it might be difficult. If for some reason your boxer is more stubborn then usual that is a easy way to fix it. In my opinion you just need to make sure you do the trainings after a walk. Not a very long cause a exhausted dog is not a very trainable one but enough to make your boxer more calm. For mine a 15 minutes walk wass enough but you can test to see if yours need more or less or even no walk at all before the training session. You can also chose to teach other things to your boxer since you use a command and a reword. Having said that in my opinion this is not so quickly if you try to teach too many stuff at the same time. I personally prefer to teach one thing and when I feel it is well learned then I pass to another and just test the older learnings from time to time. After a few weeks the result is simple, you do not need to give a retreat to make sure your dog do as you ask. 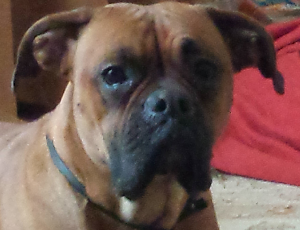 Concluding, for me boxers are a really great breed we just need to make them obedient like every other dogs. Is not very difficult! Dog training just requires patience and dedication. Then we will have great years with our mascots. I think it pays a lot! !